LINCOLN, NE (May 26) – Express Oil Change & Tire Engineers ® has received World-Class Franchise® certification from the Franchise Research Institute®. The recognition comes after an independent franchisee validation survey conducted by the Franchise Research Institute, in which 71.4% of all Express Oil Change & Tire Engineers franchisees participated. The survey was designed to determine the quality of 10 key metrics crucial to franchisee success within the Express Oil Change & Tire Engineers franchise system. The survey asked Express Oil Change & Tire Engineers franchise owners to rate their franchisor through a series of questions in categories such as overall quality, growth potential, support and communication. 98% said they would recommend this franchise to a prospective franchisee. 100% gave a positive grade to initial training and opening support supplied by the franchisor. 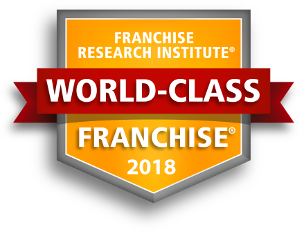 “We have been working with the Franchise Research Institute for over a decade now to survey our franchisees each year, because we want to know what our franchisees are thinking in terms of the services that we provide them, and how they are feeling about the value of our business. Understanding our franchisees opinions is vital to us as we grow the business together,” said Don Larose, Senior Vice President Franchise Development.